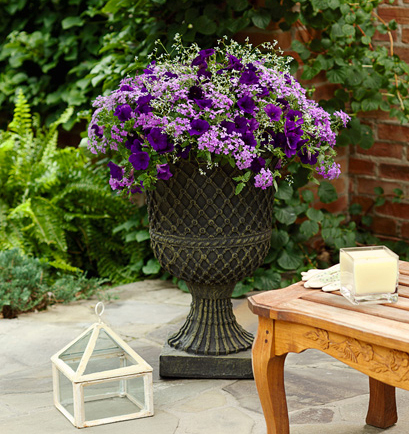 Our ‘Glory Days'™ Proven Winners® Combination is a sun-loving combination for spring and summer color with a purple/blue theme. Glory Days includes Supertunia® Royal Velvet, a petunia hybrid, Diamond Frost® Euphorbia and Superbena® Large Lilac Blue, a verbena hybrid. 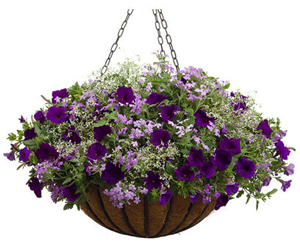 Royal Velvet and Lilac Blue are both spillers to provide depth to your container or flower bed by trailing outside of the basket or bed boundaries. Diamond Frost is a filler that provides contrast, height and texture. The plants in our 'Glory Days' Flowering Combinations are grown and shipped in fine quality growing medium and are guaranteed to arrive alive and ready to thrive.